What is the average settlement for a dog bite in Virginia? Question: What is the average settlement for a dog bite in Virginia? Pain and suffering: This is the right to compensation for physical pain and suffering and mental anguish you have suffered and could possibly endure in the future. Loss of Earnings: You are entitled to recover for the loss of earnings which you suffered from your injuries. Future Loss of Earnings: If your injuries have prevented you from your ability to earn income in the future, you can recover damages for the value of the reduction in earning capacity with reasonable probability which will occur in the future. Disﬁgurement: If the injury causes scarring or other unsightly marks, the victim is entitled to recovery for the disﬁgurement. Because these injuries are often in very visible places, victims are often very self-conscious of their appearance. Children are frequently bitten in the facial region and require plastic surgery. Medical Expenses: Damages include any sort of medical expenses that a victim has had to pay for at a hospital, clinic, or to a pharmacy. In Virginia, there are strict deadlines for filing a lawsuit. In many cases, Virginia provides a two-year deadline also known as a Statute of Limitations. However, sometimes special circumstances apply and can alter that deadline. It is important to contact an experienced attorney as soon as possible after the accident to protect your rights. Virginia Dog Bite Lawyers – Contact us today. If you’d like to discuss your case with one of our Virginia dog bite lawyers, give us a call or send us an email to setup an appointment. It’s free and there is no obligation. After learning more about what happened to you or your loved one, we will help you to understand you legal options. 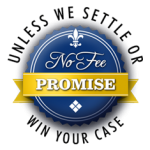 If you do decide to retain us to represent you, we have a no fee promise – you pay no legal fees unless we settle or win your case. flew out of the house and attacked her. Please understand that all cases are different and the results of one case cannot be used as an indication of what our firm may obtain for a similar case. We are Virginia dog attack lawyers who represent victims of dog bite injuries and attacks in: Accomack County (Eastern Shore), Alexandria, Alleghany County, Amherst County, Augusta County, Charlottesville, Chesapeake, Culpeper, Dinwiddie County, Fairfax County, Fauquier County, Fluvanna, Franklin, Greene County, Hanover County, Henrico County, Isle of Wight, Loudoun County, Nelson County, Montgomery County, Newport News, Norfolk, Petersburg, Portsmouth, Prince William County, Rockbridge County, Richmond, Virgina Beach, Williamsburg, Roanoke, Suffolk, Sussex County, Northampton County, Hampton , Eastern Shore and all of Virginia.